Ink wash and watercolour comics: what, how, huh? Back in 2008 when I first started really drawing comics, I signed up for an ink drawing class at CAE in Melbourne. The class was amazing. I was hooked on ink washes, using them to add texture to my panels and pretty soon EVERY comic I created used ink wash or watercolour. Fast forward to my arrival at CCS where I discovered for the first time the beauty of the bitmapped line… and realised the heartbreaking consequences of the way I work. You see, up until getting a proper education in comics making, I always did all my artwork on single pages. I didn’t separate the line work and the colour or washes. Because I didn’t know how good a crisp line could look. Hence my dilemma – how does one/ should one separate line work without taking away from the art as a finished page? Most artists suggest working in one of two ways: draw the line work first then 1) use a lightbox and watercolour paper to do your washes or 2) scan the linework and print it onto the watercolour paper at a low opacity in blue or grey. BUT I can’t actually tell the tone or colour of ink and watercolour when it’s on a lightbox, which makes me turn it on and off like a crazy person, and I don’t want to spend the dosh printing pages out in blue. So in the last month I’ve trialled two other ways of working. Solution? No pencils and no black line work. For my comic The Starship Boobyprize I drew my thumbnails to size on computer paper with a grid on it (free from the recycling bin at CCS) and then blew the thumbnails up to 130% using a photocopier. 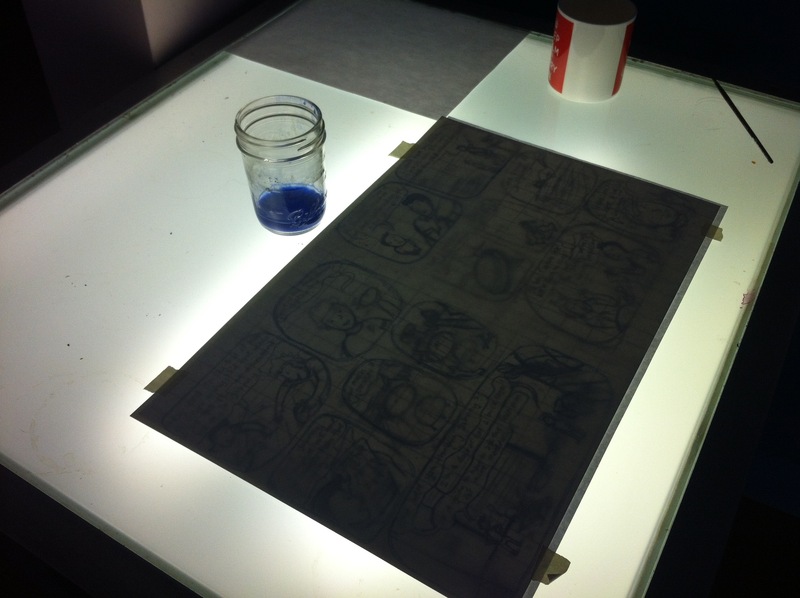 Then I used a light box and a really light blue ink wash to paint the linework onto Bristol board. Remember here that I didn’t want any black line art for this comic, the line work was all blue and red ink mixing in with the washes- no bitmapped images required. The problem being that it was actually kind of hard to accurately paint in all those little lines. But I was pretty happy with the results, the artwork was all on one page, with organic feeling washes and lines. Solution? Old school tracing paper or vellum! For this comic on the New Hampshire Primaries I did want smooth and crisp bitmapped line work so I pencilled my pages onto Bristol board and used Rapidograph pens on tracing paper I taped to the Bristol. Then I completed the washes and inking at the same time, flipping between the two. I was extremely happy with working this way BUT when I scanned the wash pages you could still see my pencils underneath. So now I guess I’m going to have to try printing the line work out onto watercolour paper and see if that works. If any other water colour comics freaks have any other ideas to share with me – please do! Don’t know if you’ve seen this watercolor demo by Sarah Glidden – lot’s of good tid bits. https://www.youtube.com/watch?v=EFMbbBI38BU – Maybe you’ll find something that you like for having crisp reproductions and gallery ready art!